Exploring Colors in Science Club, Jr.
For the past few months, I've been offering Science Club, Jr. programs here at Skokie. These programs, aimed at children ages 3-5 with an accompanying caregiver, take place in our youth craft room, which boasts laminate floors, counters, and a sink. It's the perfect space to get a little bit messy, y'all! And that's what we've been doing as families become accustomed to this new program offering: getting hands-on (and a tad bit messy) with some science. Because the room is quite snug with 15 kids and their caregivers, I've reformatted the Preschool Science programs that I used to do in Missouri for a different space. In Science Club, Jr., we focus on a main topic of the day. We first explore that topic with a story, talking about our topic as we go. Then it's time for the hands-on experimentation, which brings the program to 30 minutes. This month, we explored colors in Science Club, Jr. As we waited for our scientists to trickle into the program space, we all talked about our favorite colors. Then we shared a story: Hervé Tullet's Mix It Up! Have you read it? If not, you're probably familiar with Press Here, the great interactive picture book also by Tullet. Mix It Up! boasts lots of the same interactive aspects while also exploring how colors mix together--specifically, what happens when primary colors combine. One thing I love about the book is that it reinforces the learning about secondary colors by having kids guess what will happen several times. It's not tedious, I promise; rather, it's perfect for a group of kids whose familiarity with colors may vary. From there, I had the young scientists put on their smocks just in case things got really messy. Then it was experiment time. I had prepped our new indestructible test tubes so that each child would have access to tubes of red, yellow, and blue water (made with liquid food coloring; only 1 drop of blue per tube, please). I had also stocked each workstation with four empty cups for mixing colors, as well as a one-page, both-sides observation sheet on which the kids could record their experiments. There was room for four experiments: mixing red and yellow; mixing yellow and blue; mixing blue and red; and mixing any two (or more!) colors the child might choose. 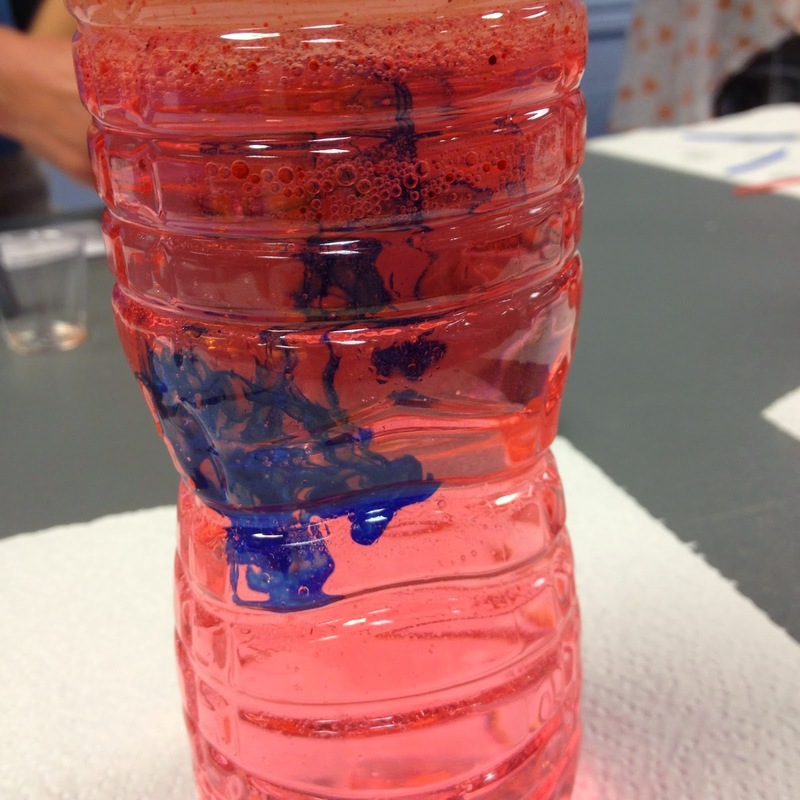 The observation sheet showed two empty tubes and one empty cup for each experiment; kids could use the appropriate colors of crayons to color in the tubes to show what colors they mixed, and then to color in the cup to show what color resulted. Kids had so much fun getting to mix primary colors to create new colors they also recognized. Many of the kids seemed to enjoy the process of recording their experiments by coloring in the observation sheets, too. I tried to prompt the caregivers, who assisted their young scientists in the experiments, to ask thoughtful questions about "What do you think is going to happen?" and "What do observe from mixing the colors," and I have to say I was satisfied with the interactions happening between children and caregivers throughout. Some kids (and caregivers) needed a bit more step-by-step guidance to proceed through the four experiments, but others were pleased as punch to get down to business and try mixing anything and everything. That's a sign of a great scientific exploration, if you ask me: high engagement and interest in what else might happen. When all was said and done, this was a simple, straightforward, and engaging edition of Science Club, Jr. It used all items we already had on hand: Mix It Up! by Hervé Tullet, plastic test tubes, paper cups, water, liquid food coloring, and crayons. The only thing I needed to make from scratch was the observation sheet, which you're more than welcome to access for yourself here. If you offer this program, or some other permutation on exploring the science of colors with young children, I'd love to hear how it goes for you. I've also previously offered a Preschool Science program on colors, which you can read about here. Over the few years since I started offering Preschool Science programs at my previous job, and in particular as I started blogging about those programs for the ALSC Blog, I've gotten a bunch of questions from librarians all over asking for some additional details on how I ran those programs. I am always so happy to answer questions about these or other of my programs; why should every programmer have to start from scratch for every program? It's so much more efficient to start with examples of programs that have succeeded at real libraries, culled from whatever sources you prefer. So, on that note, today I'm sharing a Q&A pertaining to my Preschool Science programs, inspired by some recent questions I've had about theme. I'm referring to the Preschool Science series of programs I started at my previous job in Missouri--I haven't written about my similar programs here at Skokie yet. Do you offer these programs on a one time occasional basis, in scheduled sessions of multiple weeks in a row, or are they integrated into a schedule that also includes non-science storytimes? 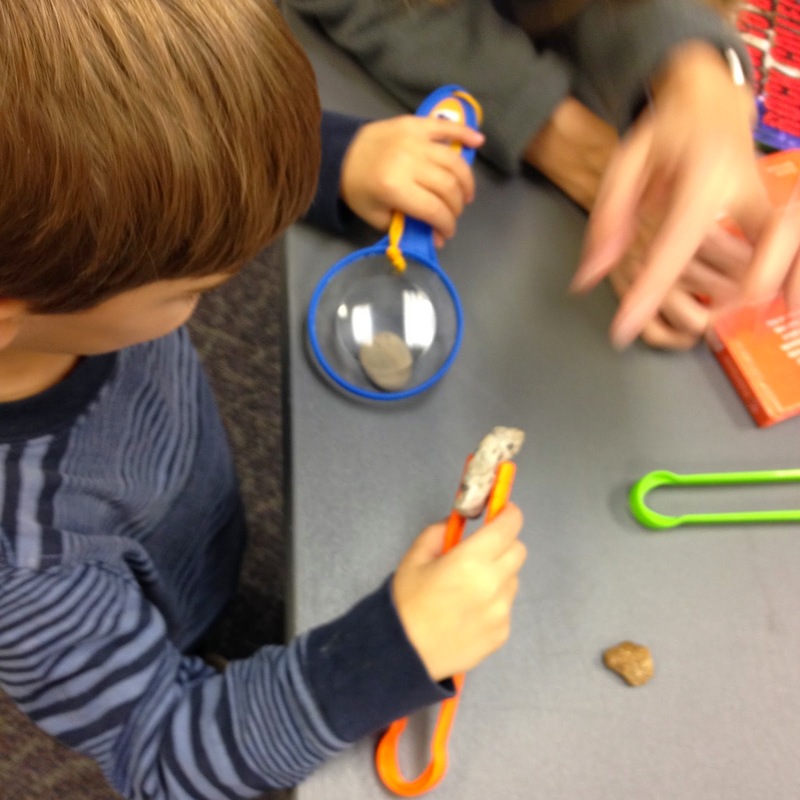 Preschool Science programs appeared on the program calendar for the branch library every other month, or six times per year. 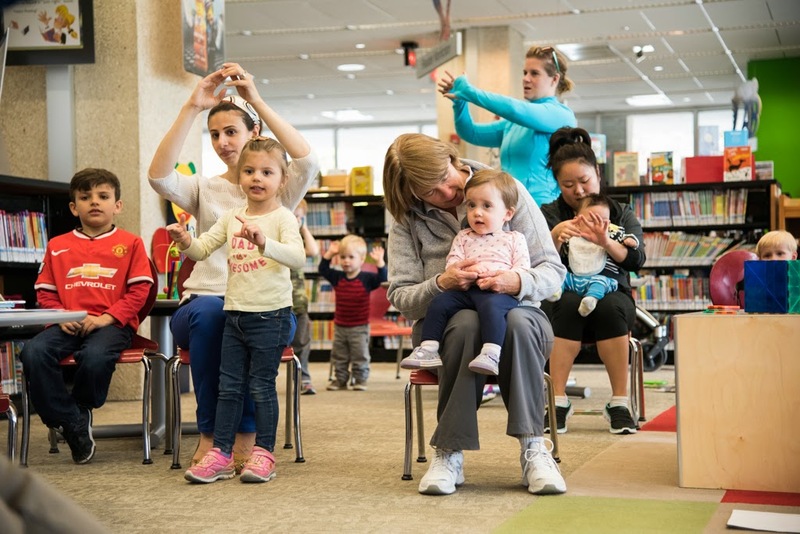 The regular branch storytime schedule involved three weeks of back-to-back storytimes each month, but Preschool Science (and any other “bonus” preschool programs, like dance parties, etc.) were scheduled in addition to regular storytimes. We did make an effort to schedule Preschool Science on a day of the week that we didn’t usually have a storytime; this decision was to allow as many families with a range of schedules and availability the option to attend one of our early literacy programs. I certainly do integrate fingerplays and rhymes into Preschool Science programs. I prefer to match rhymes and other elements with our science topic--as another way to reinforce basic concept knowledge--but if I need to throw in a song for a fidgety group, I’ll do that, too. I haven’t always found songs, rhymes, or fingerplays that match all my science topics, but I’m always on the lookout. Do you set a lower age limit, or do babies and toddlers come to play too? The programs are advertised for ages 3-5 with a caregiver. Siblings are welcome to attend as well, but the program content is not geared at younger children. How long does a typical Preschool Science program run? The story and other concept introduction portion lasts 10-15 minutes, and then kids are able to spend the rest of the time at any or all of the hands-on stations (with their caregivers). As a result of this self-paced format, the program can last anywhere from 20-45 minutes. That is, after everyone finished the introduction portion together, some kids will spend 5 minutes at the stations while others will happily spend 30 minutes. It’s up to them and their level of engagement. I imagine these events are wildly popular. Do you register and/or cap attendance, or is it come one come all? I have always put a registration limit on my Preschool Science programs because of the size of the program room. Technically speaking, I could easily do the storytime introduction portion for a huge group, and since the hands-on activities are self-paced, there’s no limit to potential audience their, either. So I’ve just always let the capacity of the room be my guide for capping attendance. That said, if a coworker were leading the program and felt more comfortable with a restricted group size, I’d totally accommodate that. I see you set up stations for after the storytime. Some of them seem sequential, while others seem to be more go-to-what-interests-you in any order. How do you decide what set-up will work best for a given program? Does one way work better than another in terms of: How kids enjoy it? Getting the lesson across? What is easiest to do? Let me start off by saying that, when I’m planning the hands-on stations, I never envision that they need to be done in a certain order. I intentionally plan for the stations to be able to stand alone; this is because, with the self-paced nature of the hands-on exploration time, I would have no control over who goes to what station when, and I also wouldn’t want to create a bottleneck of everyone trying to do the same stations, in the same order, at the same time. So I make sure that stations can be done in any order at any pace and still be meaningful. Kids really seem to enjoy the fact that stations are self-paced, as it allows them to spend an amount of time on an activity that is appropriate to their attention span and interest. Also, because stations are self-paced, it is expected that the child’s caregiver will “do” the stations with the child. As a result, kids seem to love getting to “do” science with their grownup, whatever the particular activity is. I do make sure, in setting up each station, that I include on each table a caregiver “cheat sheet,” if you will, which gives brief, simple instructions for the activity at the particular station as well as a few key vocab words and/or questions they can ask their children as they do the activity together. That’s how I try to ensure that the science concept for the program gets across. And to reiterate an earlier point, I think it’s easiest to offer standalone stations to keep the flow of the room moving. If I had to spend my time in the program helping people take turns along a set course of stations, I wouldn’t have time to meander about the room and talk to kids and caregivers about what they were doing and observing. Putting these programs together, do you tend to start with a book you like or the concept? When I first started offering Preschool Science programs, I would start with a basic science concept and then build a program around it (i.e., find a book or books, figure out some group discussion activities, and then plan the stations). After I’d gotten the program rolling for a few months, however, I started to keep a list of newer picture books that would lend themselves well to a science topic of a future Preschool Science program. Do you have additional staffing requirements to run the stations? Because the stations are self-guided and standalone, and because caregivers are expected to attend with their kids and go through the stations with them, I don’t require any extra staffing for the stations in the program. I’d occasionally have a homeschooled teen volunteer come before a program to help with set up the stations, but didn’t require additional help in the program. Do you have a set end time, or do people linger and trickle out gradually? I booked the program room for a 45 minute long program. As I mentioned above, some kids and their caregivers only stayed for 20 minutes--that was sufficient time for them to go through the activities in a way that was meaningful and interesting for them. Others (usually slightly older preschoolers) stayed in activities for much longer, and so the 45 minute cap gave them good parameters for when it was time to wrap up their explorations at the library. I did always encourage further exploration at home, so it never felt like I had to kick a kid out of the program when our time was up. You have noted positive caregiver/child exchanges at the stations. Have you had similar interactions between librarian and caregiver? Yes! I always tried to talk to caregivers as I meandered between hands-on activity stations. This was especially possible with the caregivers of kids who stayed longest in the program. I would talk to caregivers about how they could replicate simple science activities at home; how they could ask open-ended questions to help their children learn; and I’d also answer questions about science resources at the library and elsewhere in the community. The interactions were great, and they left me feeling confident that science wasn’t just an at-the-library thing for many of the families--that they became dedicated to being scientists at home, too. Do you have any additional questions about how I've done Preschool Science programs? Ask away in the comments! The village my library serves is remarkably diverse. It's been that way for decades, with large community initiatives like the Festival of Cultures and Coming Together in Skokie and Niles Township meant to celebrate and explore that diversity on a continual basis. 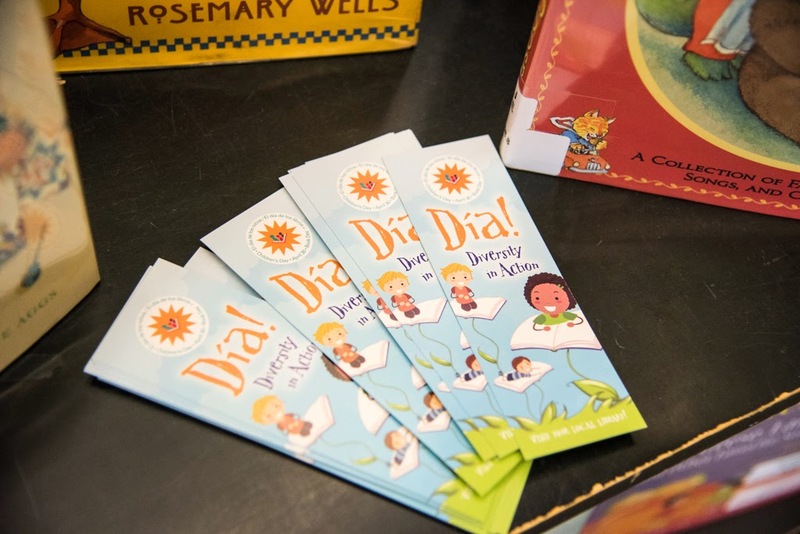 In putting together my first Día program since coming to this library, I wanted to do my best to help the diversity of our community show through in a Día program. My attempt at this goal was Rhymes Around the World. Rhymes Around the World was a 30-minute storytime-style program that took place smack dab in the middle of the preschool area of the youth department. I intentionally opted to do the program in an open space (as opposed to in a program room) so that anyone who happened to be in the library on our program morning would be able to join in, even if just for a few minutes. 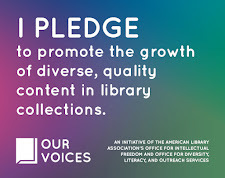 As part of my planning process, I sent out a call to many of the library's contacts within cultural community groups in the village; these are groups the library has had working relationships with, and who are huge supporters of the library. 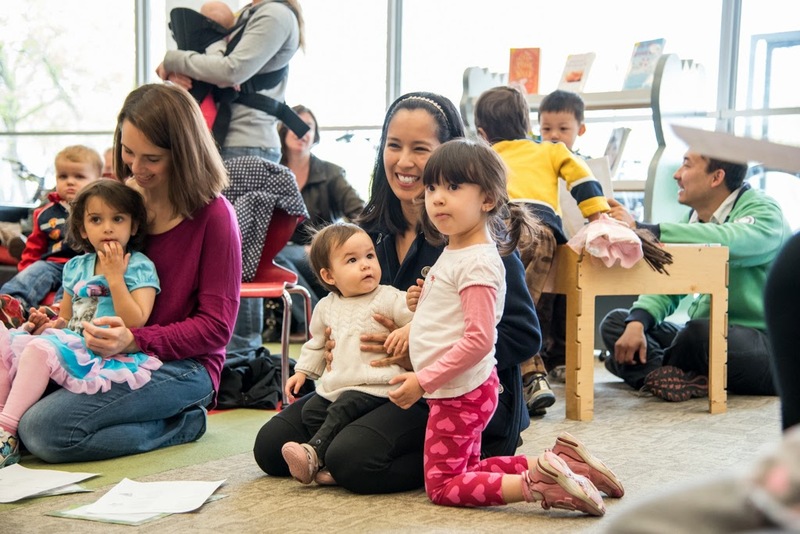 The invitation: to share favorite nursery rhymes and/or songs with the program attendees, and in so doing help celebrate the culture of literacy and love for children that transcends languages and backgrounds. 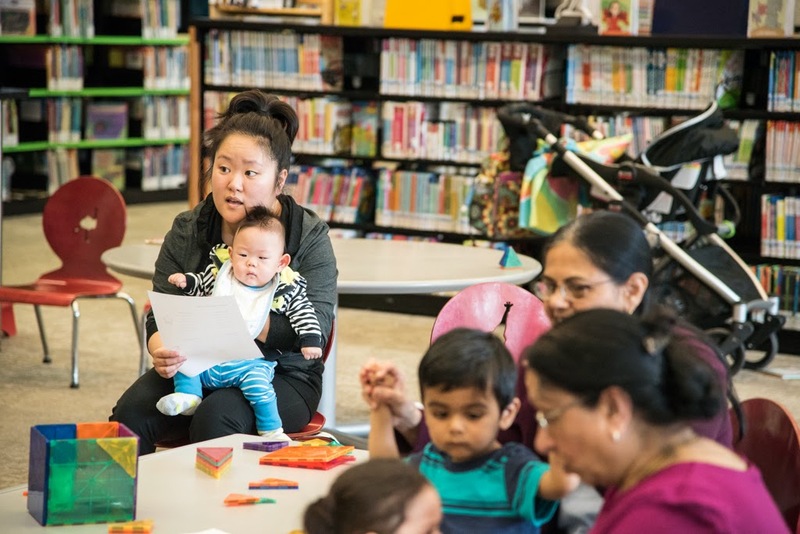 These ~50 folks enjoyed songs and rhymes in English, French, Spanish, and Urdu, with lots of caregivers chiming in to offer their children's own favorite rhymes and songs with the group. For a relatively informal event--people could come and go as they pleased--I was struck by the successful simplicity of it all: caregivers to passionate about teaching and celebrating their children; children captivated by rhymes they knew as well as rhymes the were hearing for the first time; and an overarching sense that our community shares a value for supporting young children that is not bounded by lines of culture or ethnicity. I wrapped up the program with a resonating thought: that a community rich in cultural diversity can offer something truly great to all the children we serve when we share and celebrate our literary heritages. I hope you had a successful Día celebration of your own!